This page points to all recent articles published on dslrbodies.com, sansmirror.com, gearophile.com, and filmbodies.com, and is updated as new articles appear (most recent on top). For articles from previous months, check the Articles Index Archive. These different compositions point something out: I was trying to illustrate a magazine story. That means that you need different kinds of images to tell the story fully. Photojournalists and documentarians don't just stand in one place with one lens. They look for context, they look for details, they look for contrasts...they look for story. It's a shame that this grand building has been so badly damaged. My heart is with the Parisians who are in mourning. The good news is that it appears that it can be salvaged and Notre Dame will return to its full glory some day. Bravo firefighters. I mentioned instant rebates coming later this spring. Given the low CIPA numbers for the first two months of the year, April glowers will bringing May flowers of discounts. I say hold off on any significant high-dollar purchase if it's not on significant discount. May I ask that you start your photographic-related shopping by clicking on any of the B&H links on this site, such as the following one. B&H is this site's exclusive advertiser. Starting a purchase at B&H from a link on this site helps support this site. Some of you probably aren't aware that I've long had a dedicated B&H Landing Page [advertiser link] where the items in each of four different "gear bags" I use lives. We've just updated that page and the underlying pages, as well. Tokina 100mm f/2.8 Macro Firin for Sony FE mount was announced. Sony made the 3.0 firmware available for the Sony A7m3 and A7Rm3 today. This update adds real-time Eye AF, including for animals, and adds Interval shooting. A few other minor changes are also included. Nikon shipped the 24-70mm f/2.8 S-line Nikkor for Z cameras today. If you're looking for one and can't find it in stock, let me know by email; I know of one extra that's currently available. Canon introduced the Rebel SL3 DSLR today, a mild update to the SL2. NAB 2019. The following products were announced at or just before the NAB Show in Las Vegas this week. Article on dslrbodies.com. 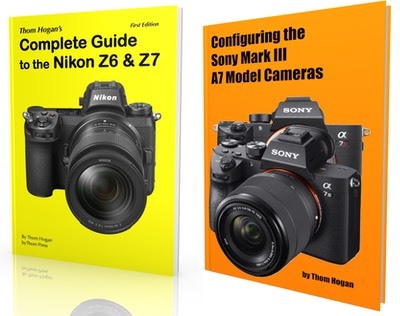 Also note that B&H has a lot of NAB specials [advertiser link] running this week. Note that these specials go well beyond cameras and lenses, and extend into lighting, audio, computers, support, bags, and media/storage. Many of these items are available only in limited supply, so if you're interested, don't hesitate. All require that you enter the promo code BHNAB19 at checkout to get the full extra savings. Also note that I've been adding data pages for new lenses as they pop up, for example the Sony 135mm f/1.8. As I note above, I'll have a WPPI/CP+ wrap-up article next week that goes into commentary. All the previous articles for my sites can be found in the Articles Index.